When I heard LUSH was going to bring some of the Oxford Street exclusive products to South Africa I was buzzing with excitement! As soon as the products were available online, I immediately placed an order. The Oxford Street items were selling like hotcakes! Most were in stock when I first started adding them to my cart, but by the time I got to the last step of placing the order, some of the items were already sold out. Alas, I missed out on some of the new products but I managed to bag most of the ones I really wanted to get my hands on. For this haul blog post, I will give you my first impressions on the products I have already used. As for the Oxford Street items I haven’t had the pleasure of using, I will give you a description of the scent etc. Let me start off by explaining exactly what the ‘Oxford Street’ collection is: Earlier this year (in April to be exact) LUSH opened a brand new store on Oxford Street, London. It gives you the ultimate LUSH experience, spread over 3 floors this superstore is home to more than 200 exclusive products. The shop also features a Gorilla Perfume gallery, regular classes, and the LUSH Spa. I was invited to the store opening of the LUSH store in Dainfern Square earlier this year and I was ecstatic when Tanya (LUSH Brand Manager) told me some of the Oxford Street exclusives would be here before the year is over. They first wanted to see which products turned out to be most popular in Oxford Street, and those would make their way to South Africa. Anyway, head over to the LUSH South Africa online store here to take a look at all the new Oxford Street goodies (plus you’ll find some of the new Christmas 2015 collection products too). I’ve already placed another online order and I will feature the Christmas items in an upcoming haul video or blog post. If you are unsure of which Christmas products to buy, take a look at my ’12 Days Of LUSHmas’ series of blog posts here (scroll down). I reviewed 12 different LUSH Christmas 2014 products, 12 days in a row and most of the products are back again this year. Refresher Shower Jelly (R 140,00 for 240g) – This is a wibbly wobbly shower soap with an invigorating zesty scent. I’m a citrus fanatic, and I love that this shower jelly contains fresh organic lemon infusion, lemon oil and organic lemon myrtle oil. The colour of it is just incredible – a vivid, metallic-yellow shade that will put a smile on your face. Refresher reminds me a lot of ‘Whoosh!’ shower jelly because it is the perfect shower companion on those early mornings when you just can seem to wake up. It’s tangy, fresh and wonderfully revitalising. I like to rub the whole shower jelly directly onto a loofah to create a rich & foamy lather. I loved how soft and radiant my skin feels after using ‘Refresher’ and, like ‘Whoosh’ shower jelly, it’s definitely one that I’ll keep repurchasing time and time again. If you like the scent of ‘Fizzbanger’ bath bomb, then you will love this too! Top Tip: It is also great to use as a shampoo, it leaves my hair feeling soft and smelling like lemons all day long. Pink Flamingo Reusable Bubble Bar (R 89,00) – Inspired by summer cocktails, this sweet & fruity reusable bubble bar is filled with floral rosewood and sensual ylang ylang. It also contains macadamia nut oil to soften and nourish the skin. To me, the scent smells like a mix between berry and orange sherbet sweeties. 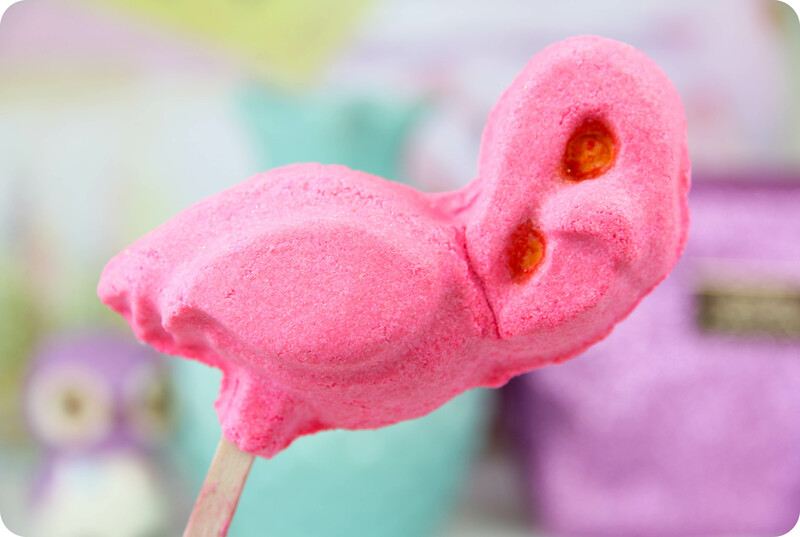 If you like sweet-smelling bath products like ‘Candy Mountain’ bubble bar and ‘Dragon’s Egg’ bath bomb, then this is right up your street. 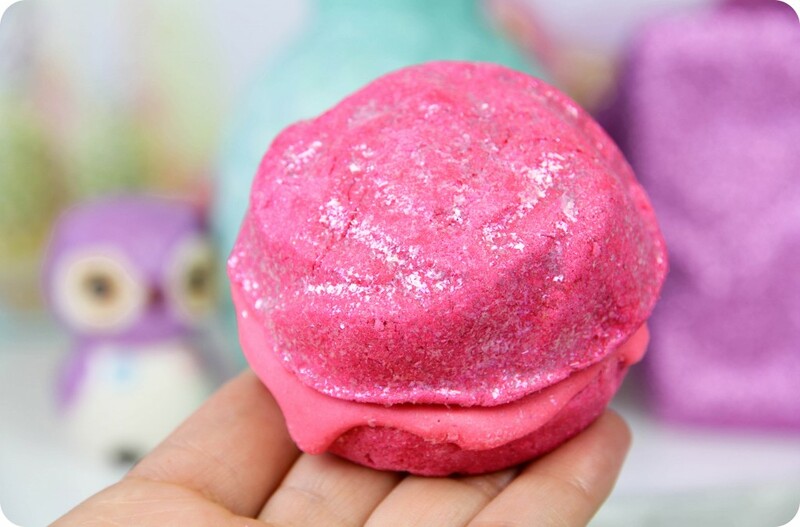 As the name would suggest, this can be used multiple times (LUSH claim that you can reuse these a good 4 or 5 times) but I think this specific bubble bar will probably only squeeze 2 baths out in total since it is a bit smaller and a bit more crumbly compared to other variations like ‘Bunch Of Carrots’. I’m usually not scared of a bubble wands breaking whilst swishing it around the water, since the mixture is a bit more durable than the normal bubble bars. BUT I did find the cute flamingo is quite unsteady sitting atop the ice-cream style stick and I fear it might fall off the stick as soon as I start using it. So I think I will use this one as I would a normal bubble bar – crumble under the running tap water to create frothy bubbles. Did you know? Yuzu & Cocoa shower cream contains the very ingredient it is named after, and yet the original bubbleroon doesn’t seem to feature it at all (strange, right?). I suspect that’s why both smell so different, the original bubbleroon smells like a tropical Pina Colada cocktail to me. 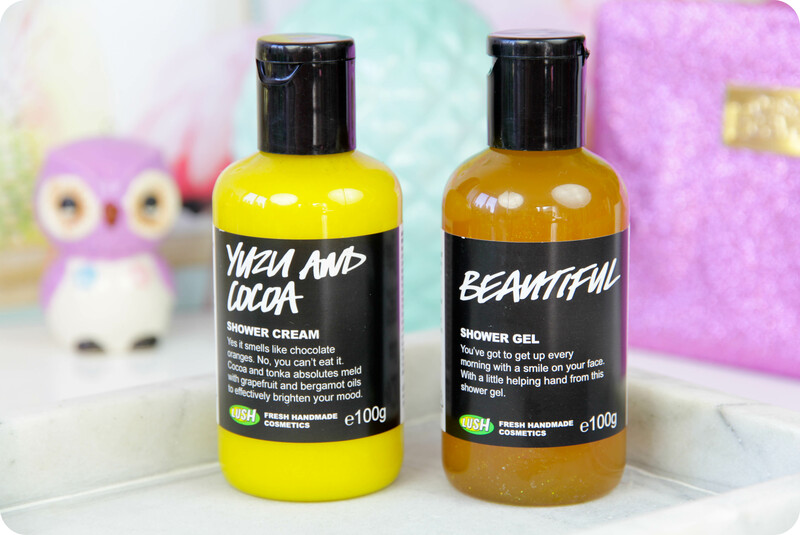 Beautiful Shower Gel (R 85,00 for 100g) – LUSH describes this as your bestie if you feel anything less than a vision of loveliness in the morning. Containing a blend of exotic myrrh resinoid, sensual musk, fresh peach juice and dried apricots, it feels both nourishing and silky soft on the skin. The burnt-yellow shower gel is sprinkled with golden lustres, making it glisten under my bathroom lights – so pretty! The scent is fresh and fruity with a citrusy twist but it’s not a sweet aroma, it’s quite unique… Imagine the bitterness of orange zest mixed with a slightly sweet & tangy scent of fresh ripe peaches and apricots. 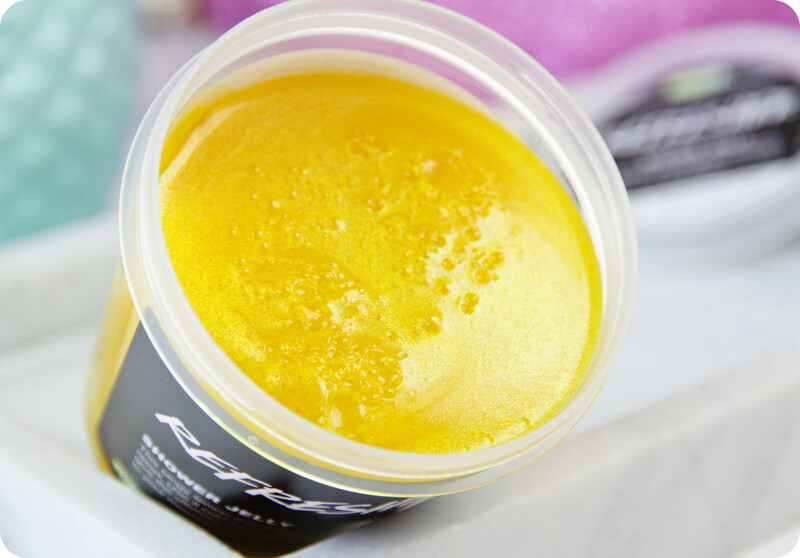 ‘Beautiful’ is quite thick in consistency and a little goes a long way, foaming up really well and creating a generous lather that is very moisturising. I haven’t really noticed glitter on my skin after getting out of the shower, but it might be because most of the lustres have drifted down to the bottom of the bottle (I personally don’t mind this as I’m not much of a body glitter type of gal). Rose Jam Bubbleroon (R 64,50) – I haven’t used this beauty as yet, but I am very familiar with the LUSH Rose Jam scent. Rose Jam shower gel comes ’round once a year during Christmas time and everyone goes bonkers for it! I must admit, it’s not my favourite scent from LUSH but I am open to trying everything at least once (especially when it comes to LUSH products). The shape of this pink bubbleroon reminds me of a French macaroon (or macaron) and that’s exactly where the name came from – it’s a bubble bar in the shape of a macaroon, it features two halves sandwiched together with a creamy filling of shea butter and coconut oil. Yum! The scent of Rose Jam is very similar to that of ‘Turkish Delight Shower Smoothie’, it contains sweet rose- and geranium oils, rose absolute and uplifting lemon oil to balance and refresh the senses. To round it off, geranium oil balances the skin, whilst coconut oil and shea butter leaves the skin feeling smooth and comfortable. The new reformulated Oxford Street Rose Jam bubbleroon (part of the permanent range) is not only larger than the original, but also looks different as well, adorned with a rose design and iridescent snowflake glitters sprinkled on top. If you enjoy the sweet scent of chewy turkish delight candies, then I highly recommend Rose Jam bubbleroon (or shower gel). I often use only half of a bubbleroon for 1 bath, and find it’s more than enough to create a luxurious bubble bath. Lord Of Misrule Shower Cream (R 155,00 for 250g) – LUSH describes this as follows: “Get down and earthy with this mischievous, herbal blend of patchouli, peppercorn and black pepper with an intriguing fair trade vanilla sweetness. As you rub this addictive lather all over the body, organic wheatgerm oil provides a nourishing dose of Vitamin E to ensure your skin is in fine (and fragrant) party form.” I love their descriptions! In the past, Lord Of Misrule was only available in bath bomb form and only came ’round once a year during the Halloween / Christmas season. Fortunately for us, LUSH decided to listen to the pleads of their customers and recently captured this special scent in a shower cream. ‘Lord of Misrule’ smells like a comforting combination of spicy pepper, earthy patchouli and sweet vanilla – it really is very unique. I love sweet scents and ‘Lord Of Misrule’ is the complete opposite of the type of fruity & sweet scents I usually go for. It makes for a nice change! The colour of this shower cream is just magical – a bright metallic grass green shade. Because ‘Lord of Misrule’ is a shower cream, doesn’t lather as much as a shower gel or shower jelly. It produces a small amount of foam but mainly spreads across the skin like a body conditioner (which means it leaves my skin feeling soft and smooth). Lord Of Misrule bath bomb was out of stock when I placed both my online orders, and as of a few days ago it has been removed from the website completely. It will probably not be coming back to the online store again (since it is a Halloween product) but I’m hoping it might be in stock at LUSH Rosebank or LUSH Dainfern Square. Milky Bath Bubble Bar (R 48,50) – Inspired by Cleopatra and her alleged love for bathing in milk, this comforting little milk bottle bubble bar is filled with uplifting orange oil and skimmed milk to nourish and moisturise the skin. It also features a cute cocoa butter bottle top (with silver lustres) to add a little bit of extra softness. I haven’t used this as yet, but I’ll be sure to let you know if it rocked my world. 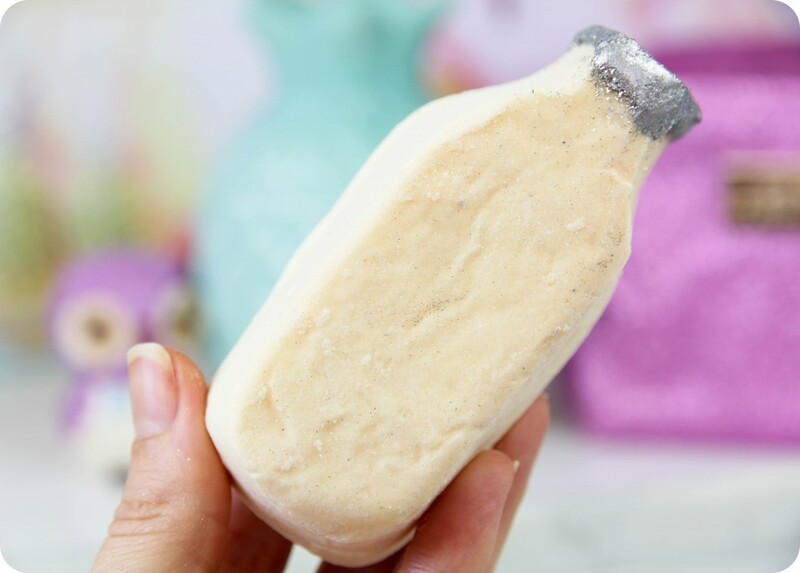 I initially imagined ‘Milky Bath’ would smell like a Milky Bar chocolate, but it’s nothing like that, it’s an uplifting yet gentle scent. Salted Coconut Hand Scrub (R 145,00 for full size) – This creamy coconut scrub smells SO good, think of vanilla-infused oatmeal porridge with a dash of citrus. A combination of fine sea salt, fresh lemon infusion, softening cupuaçu butter, and nourishing argan- & extra virgin coconut oils will keep your hands in tip top shape. I used my tiny tub as soon as I sniffed it and I immediately knew I had to buy the full size (which is exactly what I did). You can apply a dollop to wet or dry hands (I prefer it on wet hands) and scrub all over to cleanse and treat the skin. The coconut oil will ensure your hands are deeply hydrated without any sticky residue. As you probably already know, I like a subtle exfoliator and ‘Salted Coconut’ is just perfection because it is quite a mild scrub. ♥ It can be applied after a bath or shower, when your skin is clean and dry. Sprinkle a small amount into the palm of your hand and massage into the skin, the ingredients absorb any excess oils on your body and help to soften the skin, whilst giving it a light fragrance. Vanilla Puff helps skin stay dry in hot & humid weather, and will help to keep skin irritations at bay. ♥ Vanilla Puff can also be used as a dry shampoo, just sprinkle and work through your roots to remove any unwanted oiliness. ♥ You can also dust your clean sheets or towels with Vanilla Puff to give them a sensual scent. 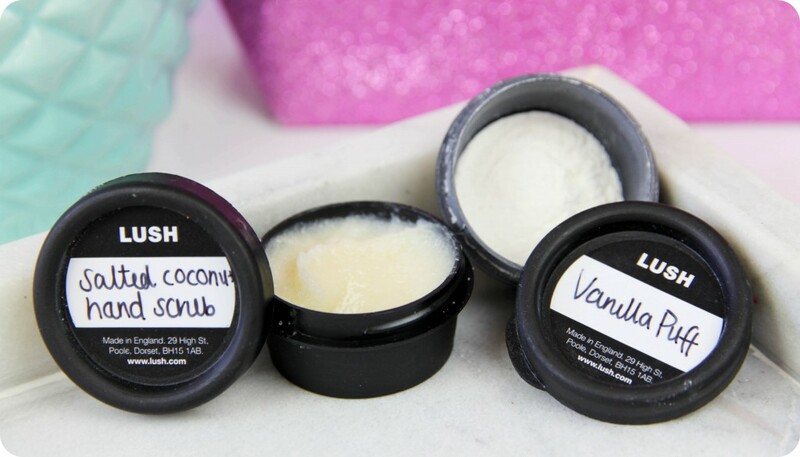 ♥ It can also be used as a on-the-go deodorant alternative to soak up moisture and keep you from becoming ‘Sweaty Betty’. ♥ You can dust Vanilla Puff in smelly shoes and gym bags to freshen them up. ♥ You can also use it as a bed sheet refresher (I’ve also heard some people use it to refresh their pets’ beds). 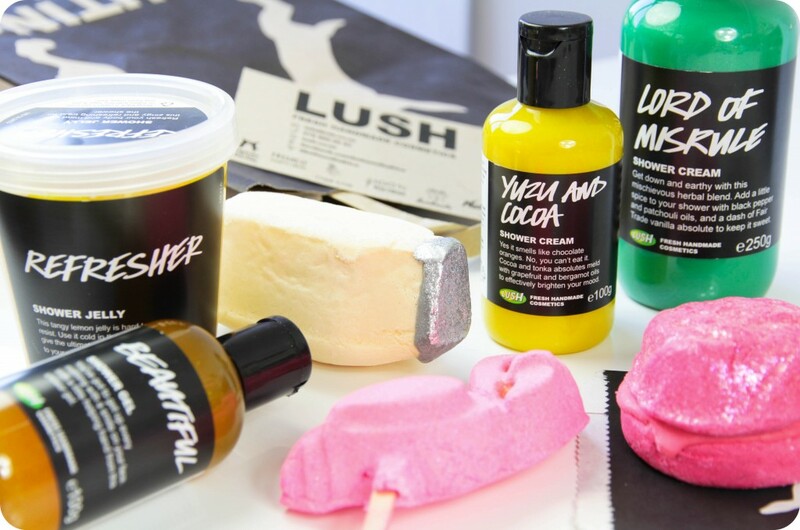 The LUSH Oxford Street products are available in the LUSH South Africa online store or at your nearest LUSH store (Cavendish, V&A Waterfront, Canal Walk, Gateway, Dainfern Square and now Rosebank Mall). Top Tip: To find out how I like to store my LUSH products to keep them fresher for longer, check out this blog post. And if you would like to read more on how I use my LUSH shower jellies, click here. Next on my ‘Oxford Street To Buy List’ is Golden Handshake Hot Hand Mask and Tangled Hot Oil Hair Treatment. Have you bought any of the Oxford Street products? What are your thoughts? Did you see? I’ve added social media sharing buttons to the bottom of my blog posts – if you think any of your friends or family will enjoy reading this blog post, please share it with them via Twitter, Facebook, Pinterest, Tumblr or even email by clicking on the icons below. Im going to Lush after work today, hopefully there are still some of the products left. Lord of Misrule and Milky Bar bubble bar is calling my name… I hope Gateway still has stock. Thanks for a great blog post, Luzanne. Beautiful photos, as always. I’m sure Gateway will still have stock of Milky Bath, but since Halloween is over you might find it’s already sold out. Your blog posts always make me want to buy everthing and spend all my money lol!! Haha! I remember when we were walking around LUSH, Beanie was SO excited about all the bath bombs and bubble bars…such a cutie! 🙂 xo Hope you’re still doing well, Chereen.